On the second day of the 66th session of the WHO Regional Committee for Europe (RC66), Member States and partners warmly received the development of a regional roadmap to guide the implementation of the 2030 Agenda for Sustainable Development, and a strategy and action plan for refugee and migrant health in the WHO European Region. Setting the scene on the second day of RC66, Dr Zsuzsanna Jakab, WHO Regional Director for Europe, described how Health 2020 is the “entry point” for integrating the Agenda for Sustainable Development into national visions, strategies, plans and roadmaps. Commenting on the importance of health in the new Agenda, Dr Jakab stated, “Health and well-being for all at all ages are at the centre of development: as a determinant and an enabler of the Sustainable Development Goals (SDGs), and as an outcome”. The Regional Director described the establishment of a United Nations issue-based coalition on health, led by WHO/Europe, to facilitate and promote the implementation of the health goal (SDG3) and health-related targets in the Region in cooperation with partners. She also expressed her intention to develop a regional roadmap to guide implementation. This roadmap, to be presented to the WHO Regional Committee for Europe in 2017, builds on existing initiatives and will include a stronger focus on areas such as partnerships, intersectoral action, equity and the means of implementation. Dr Piroska Östlin, Director of the Division for Policy and Governance for Health and Well-being, reported on progress in implementing Health 2020. Since 2012, WHO/Europe has supported 25 Member States in developing their national health policies, and provided extensive support at the subnational level. Although Member States are reporting progress and are on track for many of the Health 2020 targets and indicators, Dr Östlin cautioned that reducing health inequities remains the greatest challenge. The European Action Plan for Strengthening Public Health Capacities and Services (EAP-PHS) sets out 10 action areas mirroring the 10 essential public health operations. Speaking on the progress made so far, Dr Hans Kluge, Director of the Division of Health Systems and Public Health, noted that despite achievements and advancements, the potential of the EAP-PHS has remained largely unrealized. He highlighted the gap between the stated level of political commitment to implementation and the actual resources allocated for it, and stated that evidence on the cost–effectiveness of public health interventions is still not broadly known. Speaking on behalf of the Standing Committee of the Regional Committee (SCRC), Ms Eva Falcão of Portugal underlined that progress within Health 2020 has provided a good foundation for implementing the Agenda for Sustainable Development. Many countries detailed their national plans for implementing the Agenda for Sustainable Development, and expressed their support for the development of a roadmap on SDG implementation, as outlined by the Regional Director. Slovakia, speaking on behalf of the European Union and its Member States, expressed a wish for a stronger focus on gender equality and the empowerment of women and girls. The delegate of Slovakia also welcomed the proposal to develop a core package of SDG implementation resources and tools, building on the package developed for Health 2020. Member States adopted by consensus the resolution towards a roadmap on SDG implementation in the Region. Member States endorsed and adopted the European framework for action on integrated health services delivery, which is the result of a 3-year participatory process. The framework aims to improve health and well-being by modelling the delivery of health and social services around the needs of people. In his presentation, Dr Hans Kluge pointed out the 3 core domains – people, services and systems – that form the basis of the framework, and the cross-cutting role of change. Dr Kluge also referred to the extensive set of tools available to Member States for its implementation. Several Member States hailed the framework as an inspiration, and applauded the consultative process behind it. 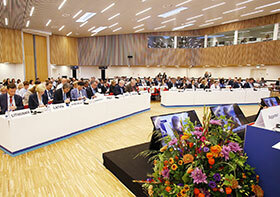 Delegates commended its timeliness in helping to achieve universal health coverage. Representatives of nongovernmental organizations (NGOs) praised the framework for its emphasis on a competent health workforce and highlighted the importance of joint action. Ministers and heads of delegations attended an interactive lunchtime session on health promotion that focused on tobacco, nutrition, alcohol and physical activity. Delegates were introduced to the “Tobacco control playbook”, a document addressing the health, economic, legal and trade arguments related to tobacco control that policy-makers frequently face. Other activities during the session included a 360-degree movie that took viewers on a journey through marketplaces. It revealed that much of the food on offer exceeds WHO limits for salt and trans fats. Presenters also introduced a new report on alcohol-attributable deaths, which shows that alcohol is a major factor for mortality in the Region. Chaired by Panos Kanavos of the London School of Economics, United Kingdom, the technical briefing presented the challenges of and opportunities for providing access to new high-priced medicines. The WHO report “Access to new medicines in Europe” acted as the basis for the discussion. Governments are finding it increasingly difficult to afford rising pharmaceutical costs, and the pricing of new medicines poses a regulatory challenge to countries in the Region. Following Dr Piroska Östlin’s introduction to the development of the Strategy and action plan, Dr Santino Severoni, Coordinator of Public Health and Migration within the Division of Policy and Governance for Health and Well-being, explained that it covers nine priority areas for Member States and WHO/Europe. These areas are: establishing a framework for collaborative action; advocating for the right to health of refugees, asylum seekers and migrants; addressing the social determinants of health; achieving public health preparedness and ensuring an effective response; strengthening health systems and their resilience; preventing communicable diseases; preventing and reducing the risks posed by noncommunicable diseases; ensuring ethical and effective health screening and assessment; and improving health information and communication. Speaking as chair of the SCRC subgroup for the Strategy and action plan, Dr Raniero Guerra of Italy detailed the exhaustive consultative process behind its development. He pointed out that, globally, it is the first of its kind. 15 countries took the floor, expressing their strong support for the Strategy and action plan. The delegate of Greece expressed the common sentiment that this work illustrates how to transform a crisis into an opportunity to improve public health capacity in the Region. Member States identified specific issues, including the need for mental health services, the importance of building capacity among health professionals to address migrant health needs, the cultural and linguistic barriers for migrants in accessing health services and the particular vulnerability of unaccompanied children. Noting that the United Nations General Assembly will hold the Summit for Refugees and Migrants on 19 September 2016, delegates pointed to the possibility of broadening the scope of the regional Strategy and action plan. Representatives of the International Organization for Migration and the United Nations High Commissioner for Refugees supported the document, as did many NGOs. Member States adopted the Strategy and action plan by consensus. Dr Gauden Galea, Director of the Division of Noncommunicable Diseases and Promoting Health through the Life-Course, and Dr Gunta Lazdane, Programme Manager for Sexual and Reproductive Health, introduced the Action plan. They said that no other document presented to the WHO Regional Committee for Europe has been produced through so much consultation; however, some controversy persists. Sexual health was defined more than 20 years ago, and since then the Region has seen major achievements in lowering perinatal mortality rates and increasing access to safer abortions. Through the Action plan, WHO/Europe aims to ensure that everyone can affirm that they are satisfied with their sexual health. The vision of the Action plan is that all people in the Region are enabled and supported to achieve their full potential for sexual and reproductive health and well-being, and that human rights are respected, protected and fulfilled. Nearly 20 Member States expressed support for the Action plan, although some delegates were concerned that the original language was weakened in order to reach a compromise. Several Member States requested changes to the document and Turkey said they were not prepared to adopt it. The discussions will continue tomorrow afternoon.